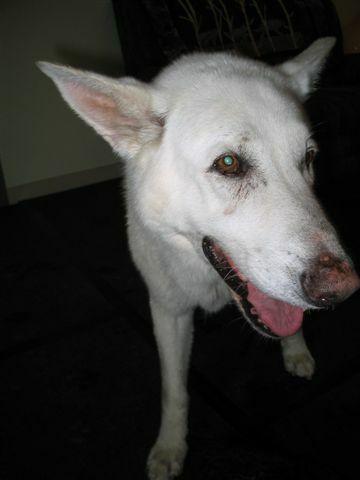 Our beautiful white Shepard, Zak has been under the care of Laurie Cramer and Gone To The Dogs since December 2006. Zak has torn ACL’s and at his weight, height and age (14) should not be alive today. 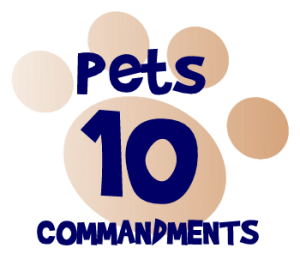 Our dogs (we have three) are our children and we have done everything to keep them healthy and happy. 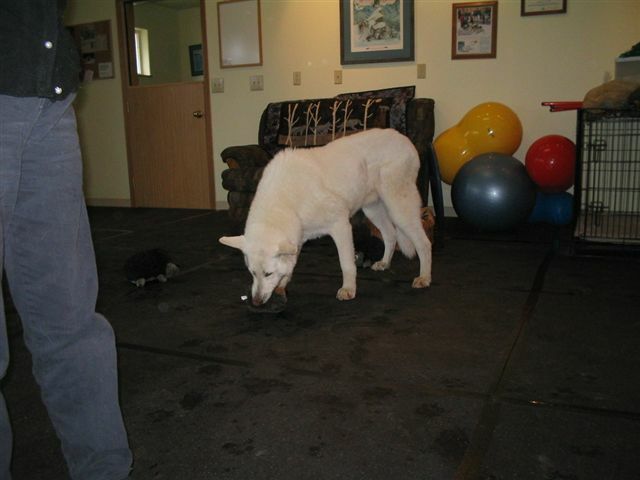 When Zak first came up lame we took him to our vet, Kenai Veterinary Clinic and Dr. Wisniewski. The Dr. diagnosed Zak with torn ACL, put him on a diet and suggested that there was a possibility of surgery, but that at his age chances are he would not live because of the anesthesia and recommended that we give Laurie a call. Dr. Wisniewski gave us Zak’s medical records, which we took for Laurie to study and she recommended a course of physical therapy specifically for Zak. 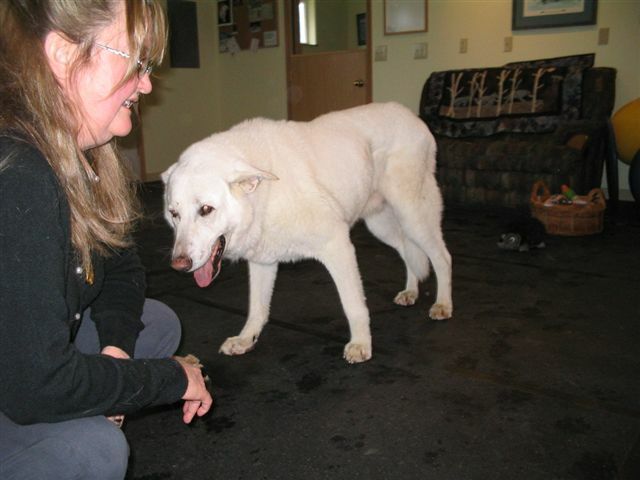 Zak has steadily improved with Laurie’s loving attention. When he arrives at Laurie’s he immediately goes to the toy basket and digs out his favorite hedgehog that he squeaks around her office until she is ready to give him his treatment. It is such a joy to see him playful again and his antics with that hedgehog are hysterical. 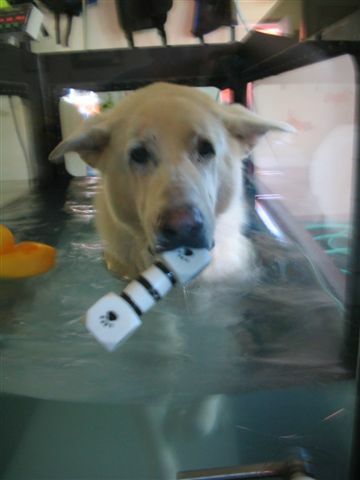 He is a grouchy old man, but loves to get in the heated pool and even is getting used to the treadmill. 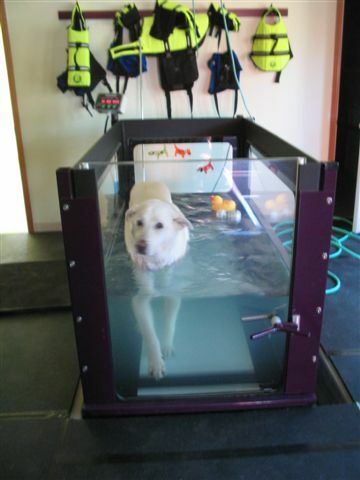 His leg’s will never be perfect again, but with the pool he has more stamina, breathes easier and is a more active and happy dog. We can never thank Laurie enough for giving our big baby added time and quality of life. All of our dogs will get Laurie’s wonderful care if and when they need it. It is the best investment we could ever have made for not only Zak, but our two other dogs and ourselves.